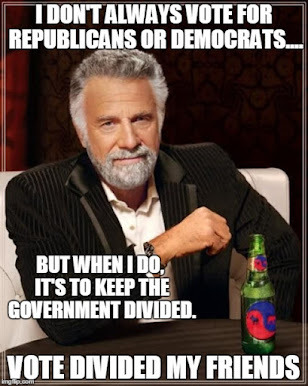 The Dividist Papers: Good News, Everyone! OK, I couldn't resist the title & pic combo. But it IS nice to finally see a small suggestion of a bright spot in the employment situation. 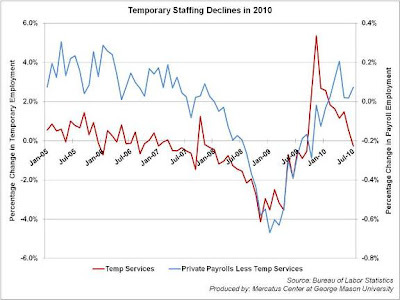 Below is a chart from the Mercatus Center at George Mason U. regarding temp staffing contrasted with payroll employment. While the short text implies the fall in temp staffing is a bad sign, I have a somewhat different take seeing the two stats together*. The fall-off in temps staffing coincides with a positive uptick in payroll hiring, which strongly suggests that an equilibrium is being reached in payroll staffing. To wit, it suggests that employers have reached a point where they have quit downsizing and insuring against further decline, and for the moment are feeling comfortable with fully staffing at their current levels of production. That's a far cry from actual growth, mind you, but given the very expensive mandates already shoved down their throats (ObamaCare, new taxes and regs), the threat of more to come (more tax hikes and even more burdensome regs), the weak economy and ongoing workout of bad assets from the real estate and financial bubble-bursts, amd the enormous uncertainties associated with all of the above, it's a positive indicator of equilibrial stabilization, perhaps due to watchful waiting ahead of the elections. Which beats the hell out of further decline and IMHO is a positive indicator of reduced "double-dip" potentials. If the "watchful waiting" hypothesis is correct, evidence of it will be found in market trends tracking the polls the closer we get to the elections, and in the election-reaction market movements the first week of November, as election results are confirmed. 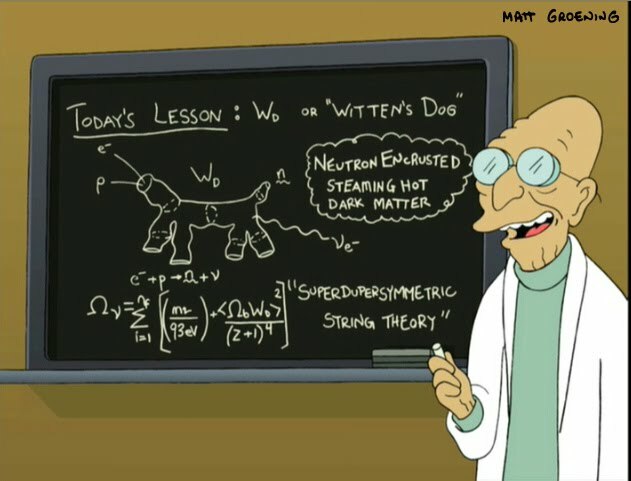 OK professor. I'm accepting your interpretation that this is an indicator of cautious optimism. Your thesis seems to be borne out with this morning's jobs number, which is apparently being widely cheered as "not as bad as we expected." Although, when they are continually revising prior months (as they do here) I have trouble understanding why anyone invests any confidence in their estimate for the current month. I thought the analysis and graphs from Calculated Risk does a great job of putting the numbers in perspective. Particularly this graph - If you kind of squint and cross your fingers, it is looking like unemployment has bottomed and we may finally have started a long slow climb back. "Cautious optimism" is the right way to put it. It's not an indicator of anything but a stability point being reached, meaning it's indicating employers don't immediately expect things to get worse, and hope that a GOP blowout in November would signal the end of the admin's attempts to grind American business into the dust. Re: that other chart -- Yeah, same data trend, different presentation. The trend there (absent the census hiring) is flat-to-up instead of declining. When payroll employment starts to increase at rates equal to or above that needed to match simple labor force growth, THEN we're making actual headway. Right now we're still falling behind, as the broader measures of unemployment and the labor force participation rates indicate. We need to start getting up into pretty consistent job growth of +300K/month before getting too happy. Less than that is pretty much just treading water ... or sinking a bit more. The economy's not going to gain steam until the threat of the Dem's "eat the rich and tax everything" agenda has been reduced a good deal more. 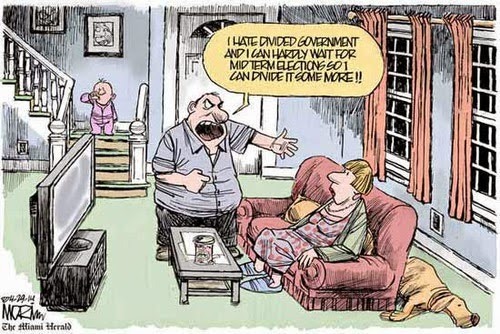 I think you should use the guy in the cartoon as your avatar. Well, it is my life-long ambition to grow up to become a senile, amoral, deranged, and unpredictable old man with a gift for creating doomsday devices and atomic supermen, but I'm still far too young and have entirely too much hair.